This program focuses on food, health, environments, social systems and education, which are closely related to the issues of poverty, diverse health problems, and gender inequality in Asia. We aim to develop women leaders who play active roles globally, have solid expertise, a comprehensive perspective, an international awareness based on a cross-cultural mutual understanding, a sense of mission, and future vision. Our goal is to realize “Well-being” - individual rights and personal fulfillment guaranteed under excellent physical, mental, and social conditions. 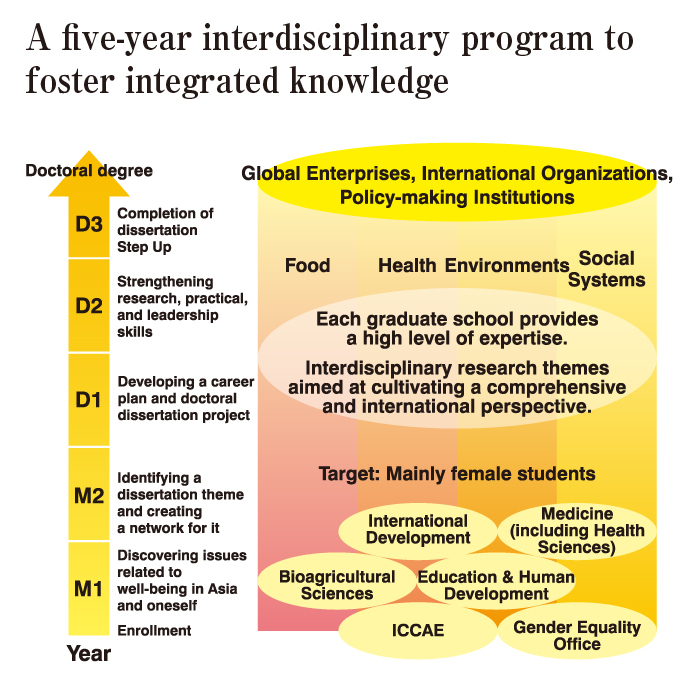 This interdisciplinary program encompasses four Graduate Schools: International Development, Education and Human Development, Bioagricultural Sciences, and Medicine (including Health Sciences). 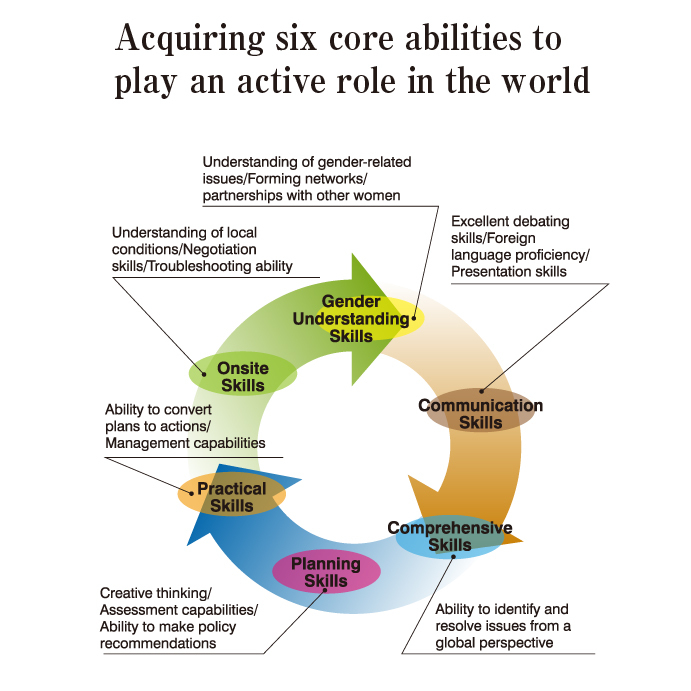 Its major feature is to facilitate the acquisition of “integrated knowledge” and to cultivate “six core capabilities,” which are difficult to develop through a conventional “compartmentalized” university education system. Students steadily acquire the confidence and awareness to play an active role as leaders. 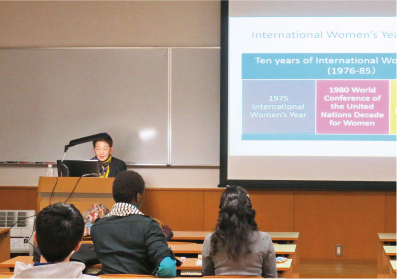 In the near future, graduates of our program will aspire to be global leaders and change Japan, Asia and the world. In order to solve the problems that global communities face, it is important to experience different cultures and cultivate a comprehensive and international perspective toward interdisciplinary research themes. Therefore, we have implemented a curriculum that includes lectures and seminars in English and practical education in cooperation with partner universities mainly in Asia and international organizations/international cooperation organizations. These include: the United Nations Children's Fund (UNICEF), United Nations Population Fund (UNFPA) and Japan International Cooperation Agency (JICA), and global enterprises. In addition to the elaborate instruction system provided jointly by four Graduate Schools, we conduct continuous support both during and after the program through the university’s well regarded mentoring system. Through overseas fieldwork conducted in Asia, students acquire knowledge and the ability to identify issues in a given region and discover why “well-being” is not achieved there. In addition, the students view, experience and feel firsthand to see what they can/must do to carry out their work. 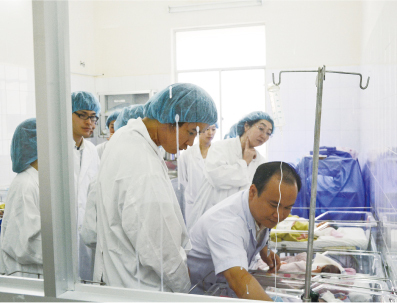 Students stay in Asian countries such as Vietnam, Indonesia, and the Philippines for a specified period of time, and carry out research along selected themes such as maternal and child healthcare, religion, and natural disasters. Students from different specialties and nationalities organize teams and work together. While focusing on high specialty, students acquire the capacity to identify and solve problems from a global perspective by developing an interdisciplinary mindset for the selected research theme. At workshops for global leader development, we invite global leaders from organizations such as UNICEF, UNFPA, FAO, and JICA as lecturers, and they discuss various issues on “well-being.” They also highlight the skills needed to work actively in the international society and strategies for career development. Furthermore, after the lecture, there are career counseling sessions. These workshops provide students with an opportunity to think about their future vision, career path and develop the skills to realize them under the direct instruction of the lecturers.